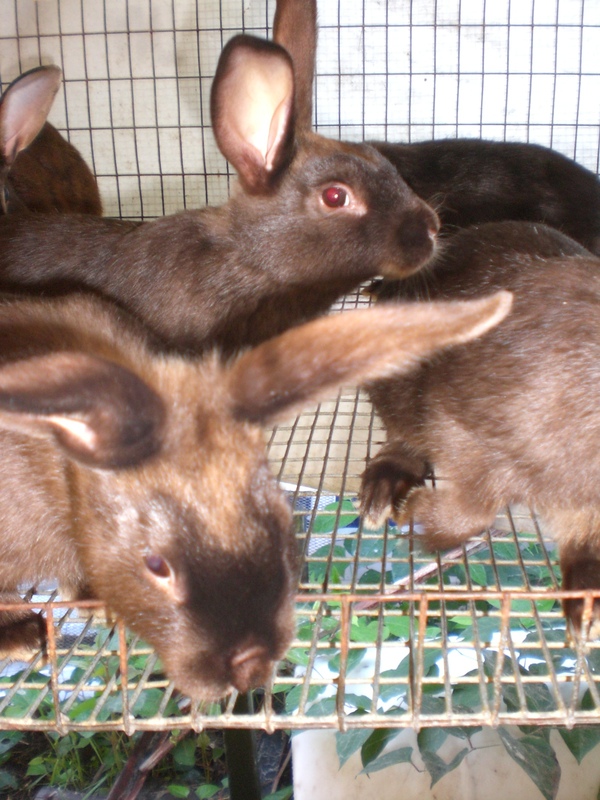 One of the breed of rabbits I raise are called Satins. They are a large breed, derived from a genetic mutation in the fur of some New Zealand Whites back in the 1930’s. This mutation caused a hollow hair shaft, which gives a beautiful shine and quality to the color of the coats of this “heavyweight” breed. They come in lots of colors, and are generally calmer and easier to handle. The Satin of today is a very different breed from the New Zealands because in order to put color on that fabulous hollow hair shaft the white NZ mutation was crossed with many other breeds, and then the body was reestablished. The Satin is genetically diversified the natural way. I have heard that the New Zealand breed has only six breeding lines! Here’s what I did in breeding- I took great stock from very distant strains, and then bred the best I could get. By crossing the colors and the two lines they have the quality and benefits of hybrid vigor. That is when two diverse satins are crossed and unusual strength, beauty, size, or vigor is noticed in the young produced. Satins are also a excellent meat rabbit not only for meat, but also for their awesome pelts. The hair of Satins have a hollow, luminous hair shaft that gives them a great deal of sheen. They have 12 color types, black, blue, Californian, chinchilla, chocolate, copper, opal, otter, red, Siamese, white and the broken group. The ideal weight of this breed is 9.5 -10 pounds. Satins have a high meat to bone ratio and make a 5 pound fryer well in the 8-12 week time frame. A study was done comparing the new zealand white and th e satin. The NZW reached 5 pounds earlier than the Satin, but took 100 pounds of feed to raise 8 kits to 5 pounds. The Satins raised 8 kits to 5 pounds it took a few weeks longer but only used 85 pounds of feed. Satins are easy to breed are good mothers have 5 to 11 kits in a litter and foster other kits with no problems with good milk production. If your not sure what breed is for you the Satin is a great choice for your homestead! I breed blacks,blues and Chocolates and have been selectively breeding these for winter production and am happy with the results!